The book emerged as the result of a casual conversation that took place one sunny winter’s afternoon. I had been working on the BBC documentary – the editing was almost complete and I was back in the office tidying up some paperwork. I was complaining that the story of Fermat’s Last Theorem was so wonderfully rich that it was impossible to cram it all into 50 minutes of TV. The result was great, but the documentary was not going to cover any of the history between Fermat and Wiles, and the amount of mathematical explanation was going to be very limited. At the time, I was sharing a desk with Sanjida O’Connell, who was not only a TV director but also a writer. She suggested that the solution was obvious – write a book. Up until this point, I had never considered writing a book. Mind you, when I was in the middle of my PhD, I never considered going into television, so leaps into the dark were not exactly new. I had written a few articles while I was at college, and I like to think that my PhD thesis was a considered piece of writing, and when Sanjida made her suggestion I had just been commissioned to write my first newspaper article (a piece about the Taniyama-Shimura conjecture for the Daily Telegraph), but writing a 400-page book was a daunting prospect. Sanjida introduced me to her literary agent, Patrick Walsh, who for some inexplicable reason took a chance on a rookie who wanted to write a book about an arcane mathematical theorem. When Fourth Estate agreed to publish the book, I was shocked. I suddenly embarked on a whole new career. I was still working at the BBC, which meant that every evening, weekend and holiday was spent writing. It was a twelve month slog to write 120,000 words and meet my publisher’s deadline. People often ask me if I expected Fermat’s Last Theorem to be a success. Of course not! I was chuffed simply to find a publisher. In the back of my mind I hoped that the book would register in the New Scientist Top 10 list of science books, but that was about the limit of my ambitions. I only began to realise the book’s potential when an American publisher showed an interest – namely George Gibson of Walker Books in New York, one of the most brilliant editors in the world, and that is not an overstatement. And then there was a German publisher, and an Italian publisher, and a Japanese publisher, and a Catalan publisher and a Brazilian publisher, and so on. When the book was published in the UK, it took less than a month for the book to register in the bestseller list. Each week I would race to find out the new lists to see if the book had gone up or down. It became an obsession. The ridiculous thing was that the book kept on climbing, overtaking tabloid books about serial killers and mystical nonsense, and also leap-frogging wonderful books such as Longitude and the Diving-bell and the Butterfly. Eventually it hit the No.1 spot. It was only there for one week before being toppled, but that did not matter. 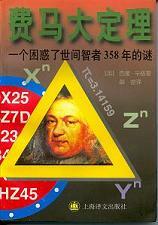 Fermat’s Last Theorem had confounded expectation to become the first book about mathematics to be a No.1 bestseller!